R. W. Apple, Jr., of The New York Times credits third-generation Alabamian Frank Stitt with turning Birmingham into a "sophisticated, easygoing showplace of enticing, southern-accented cooking." His southern peers think his cooking may have a more profound sense of place than any of theirs. His food is rustic and homey, but sophisticated in method. Now, Alabama's favorite son has written a long-awaited cookbook that features his enticing Provençal-influenced southern food. More than 150 recipes range from the traditional--Spicy Green Tomato and Peach Relish, Spoonbread, and Pickled Shrimp--to the inspired--Slow-Roasted Black Grouper with Ham and Pumpkin Pirlau and Pork Loin with Corn Pudding and Grilled Eggplant. Desserts such as Bourbon Panna Cotta and Sweet Potato Tart with Coconut Crust and Pecan Streusel elevate the best of the South for cooks everywhere. Frank Stitt is the chef and owner of Highlands Bar and Grill—which won the 2018 James Beard Awards for Outstanding Restaurant and Outstanding Pastry Chef—Bottega Restaurant and Café, and Chez Fonfon, all located in Birmingham, Alabama. He has won the James Beard Award for the Best Chef of the Southeast and has been inducted into the James Beard Foundation’s “Who’s Who of Food and Beverage.” He received the Lifetime Achievement Award from the Southern Foodways Alliance for his elevation of Southern cuisine and his early advocacy of locally grown food. 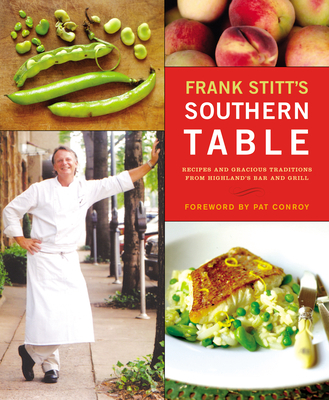 He is the author of Frank Stitt’s Southern Table and Frank Stitt’s Bottega Favorita.